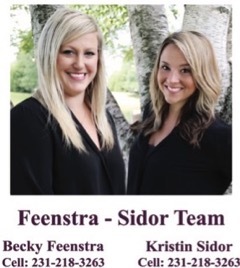 As a great local real estate team we, Becky Feenstra and Kristin Sidor, know how to use the most up to date technology to sell your home. With a combined 16 years experience in real estate, we love helping people, property, and real estate in general. We will help you form a pricing strategy based on thee latest information. Most importantly we'll develop a dynamic marketing strategy tailored to you and your home. We will be there for you every step of the way, from consultation through closing and beyond. We look forward to working with you! Based in Rockford, with a satellite office in Silver Lake, we combine our love of water, travel, boating and Michigan as a whole. Whether you are looking for your home in Grand Rapids, or your vacation on the Lakeshore, we can help you find the Good Life!